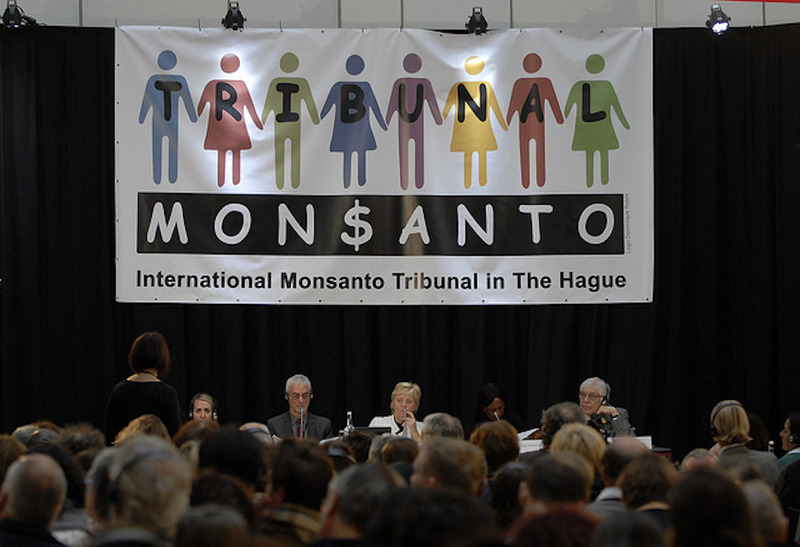 The advisory opinion of the Monsanto Tribunal reinforces what grassroots movements all over the world have been contending for decades: that the future of our food lies in the hands of small farmers, and it is the ecological model of agriculture which offers the solution to poverty, hunger and malnutrition in the world, as well as the crisis of climate change. By Ruchi Shroff of Navdanya International. The Tribunal focused on the widening gap between international human rights law and corporate accountability noting that the legal provisions in place which protect investors’ rights tend to undermine the capacity of nations to maintain policies, laws and practices protecting human and environmental rights. The Judges underscore the need to assert the primacy of international human and environmental rights law in the international legal framework and concluded that urgent action needs to be taken by the UN to avoid that key questions be resolved by private tribunals operating entirely outside the international framework. Furthermore, the Tribunal reiterates that multinational enterprises should be held accountable for their actions and be subjected to the International Criminal Court jurisdiction in cases of infringement of fundamental rights. It also found that Monsanto’s conduct has seriously undermined the right to freedom indispensable for scientific research. The future of our food lies in the hands of small farmers, producers of the majority of the planet’s food, poison-free, biodiverse and nourishing food. It is this ecological model of agriculture which offers the solution to poverty, hunger and malnutrition in the world and to the crisis of climate change. The Tribunal’s findings are a decisive blow to corporate power and underscores the importance of the work of thousands of activists, farmers, consumers and citizens around the world in the fight for a future of food free from toxics, GMOs, patents and corporate control. The Monsanto Tribunal confirmed how poisonous products and toxic chemicals such as Round Up (Glyphosate) & Basta (Glufosinate), neonicotinoids, atrazine, and other pesticides have led to the destruction of soils, to desertification, to the extermination of bees, to the rise in health epidemics such as cancer, birth defects, and respiratory disease, to name just a few. They are contaminating people by polluting areas and poisoning our food systems. The recent UN’s Report of the Special Rapporteur on the right to food, Hilal Elver, provides a clear account on the negative effects of global pesticide use in agriculture and its impact on human rights. Last September, the International Criminal Court declared it would prioritise crimes that result in the “destruction of the environment”, “exploitation of natural resources” and the “illegal dispossession” of land and that it would now take many crimes that have been traditionally under-prosecuted into consideration. The ICC , though not formally extending its jurisdiction, will assess existing offences, such as crimes against humanity, in a broader context.